NASHVILLE, TN — Nashville musician and producer Jesse Boyce compares the anxiety he felt just before receiving palliative radiation therapy to the jitters he often experienced before going on stage. The instant treatment began — and as the first note rang out — his anxiety was replaced by a sense of peace and determination. 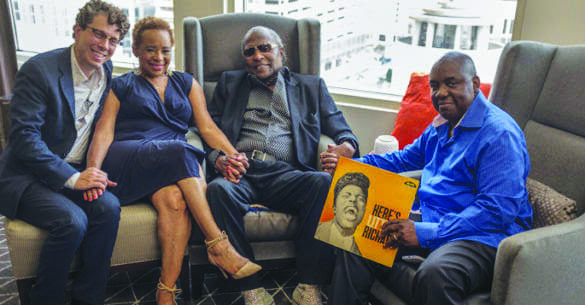 Boyce, whose incredible career as an instrumentalist, bandleader, vocalist and songwriter includes a long stint alongside his mentor and friend Little Richard, is being treated at Vanderbilt University Medical Center for recurrent, incurable prostate cancer. His journey has been documented in a feature film, “Intentional Healing,” premiering at the Nashville Film Festival on April 21, with a second screening on April 25. The 40-minute film was produced by Vanderbilt radiation oncologist Mark Stavas, M.D., who wanted to communicate a treatment philosophy that focuses on wholeness, regardless of a cure, and that embraces everything an individual brings to the table that can help improve his or her quality of life. Stavas decided to create a film for both patients and medical providers — not a staged, run-of-the mill healthcare piece — but one that would connect with the spirit and illustrate how people can pursue “intentional healing,” even as the end of life becomes imminent. He had little experience in the field but luckily was able to draw upon a wealth of family talent. One of his brothers, John Stavas, is a film director in Los Angeles. Another brother, Andrew Stavas, is a member of the popular indie rock band Kiev. Both were happy to help. When he approached Radiation Oncology Chair Lisa Kachnic, M.D., with his idea she immediately offered her support. She believes the film is important because it raises much-needed awareness about how patients face terminal illness. When Stavas asked Boyce if he would be interested in telling his story, he agreed, and the project gained momentum as storyboards were drawn, studio time booked and a crew assembled, including Kachnic’s daughter, Samantha Englert, who served as assistant director. After his initial surgery at Vanderbilt in 2003 for advanced-stage prostate cancer, Boyce had moved forward with his life, mentoring many young Nashville musicians, teaching music and life skills to underserved youth, and lending his expertise to countless music industry projects. He also serves as minister of music at Gordon Memorial United Methodist Church in Nashville, and his musical protégées often join him on stage during worship services. He had co-written a song, “Dance Again,” with one of his mentees, Phil Hughley (Gtar Phil), and in 2016 they were recording it when Boyce experienced agonizing pelvic pain and bleeding. He was rushed to the hospital where he learned his cancer had returned and was now classified as incurable. The disease has since spread, and he continues to receive treatment to minimize its impact. He credits his Vanderbilt medical team for continually offering options for hope and said he’s been treated “like a king” throughout treatment. In the film “Intentional Healing,” the meaning of “Dance Again,” becomes even more poignant as Boyce is determined to complete the recording. Hughley and Boyce return to Ocean Way Nashville Recording Studios, and Kevin Sylvester and Wilner Baptiste of the Universal Music duo Black Violin join them to complete the final tracks. Reflecting on the completion of “Dance Again” and the documentary “Intentional Healing,” Boyce says he’s achieved a goal that’s much more than a career milestone. “Intentional Healing” were part of the Tennessee First Films sessions at last month’s 2017 Nashville Film Fest.